Good for you Nanny, some good stuff to be found in skips. I'm trying to sort out my wood stock in the garage. Needs tidying so I can see what I've got. I have some projects in mind for the garden when the weather picks up. I am trying to curb my instincts to jump in skips, it's difficult. Last week I dipped into one and pulled out two boxes of brand new screws, they don't take up much room. Something else I recently found in a skip, free candles, people were downsizing and chucking such a lot out. The redundant frying pan was in my oven, I no longer fry food, but I thought I might find a use for the pan. Why can't they take things to a charity shop. I suppose the time most gets chucked out is when clearing someone else house. If you are having to travel then time is a factor, but there are charities that collect furniture, and small stuff is welcome by Oxfam shops etc. A great freebie found yesterday, they didn't have a skip but were sorting out their shed and had a lot of stuff laid out on the yard. I happened to be passing at the right time. I took the car round there and loaded up with bricabrac, some of it I will keep, but some will be cleaned up and given to a charity shop. Everything was destined for the tip until I offered to rescue some of it. 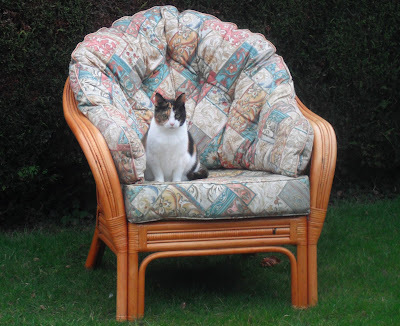 Best of all, I got a free wicker chair and cushions, it will be great in my summer house. All good condition. The cushions are indoors until the spring, when hopefully the weather gets a bit warmer. I am mighty chuffed with my free chair. Cheap is good, but free is better. 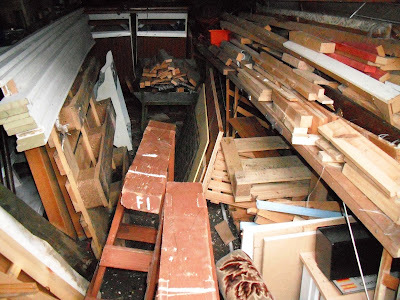 Here in the UK I live in a high rise flat and as a result have managed to find loads of furniture in the basement people dump it there when moving out. Some of my finds come up to the flat to be used by me (lots of "brown furniture" discarded to be replaced by flat pack tat ) while I put other items on our local Freegle group.